The American chestnut tree has a fascinating history. These beautiful trees once populated over 200 million acres of eastern woodlands until succumbing to a lethal fungus infestation, known as the chestnut blight, during the early 1900s. Within 40 years, over 30 million acres of chestnut trees were destroyed by the blight. According to the American Chestnut Foundation, the American chestnut tree was an essential component of the entire eastern US ecosystem. It was a late-flowering, reliable, and productive tree, unaffected by seasonal frosts, and was the single most important food source for a wide variety of wildlife from bears to birds. 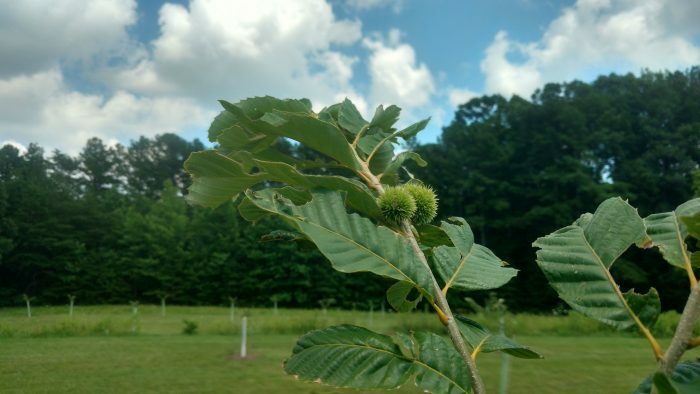 More recently, blight-resistant chestnut species have been used in breeding programs in the U.S. to create hybrids with the American chestnut. These blight-resistant hybrid American Chestnut trees have been successfully bearing nuts in orchards across the United States, including North Carolina.